Gearbox boss Randy Pitchford wants to follow up Duke Nukem Forever, but would only do so alongside another developer. In the brief history of video games, few sequels dropped the ball as spectacularly as Duke Nukem Forever. This game went through 15 years of development, multiple restarts, and a Gearbox acquisition, only to be savaged by critics for a host of problems. It's no surprise that we haven't seen a true Duke Nukem game since, but Gearbox's Randy Pitchford says he'd like that to change. There's just one caveat - Gearbox would need to produce it in collaboration with another developer. "I did not acquire the franchise merely so people could experience Duke Nukem Forever," Pitchford explained at the Develop 2015 conference today. "That was, sort of, the toll to pay to give Duke Nukem a chance at a future. So yes. In fact, we've done some concept development. The challenge is that Gearbox is very busy. A faster way would be if the correct developer would become interested and we'd work with them." 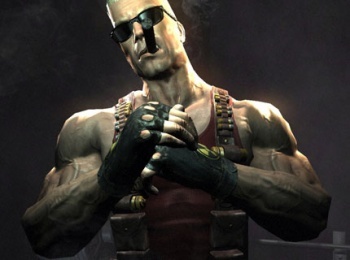 Gearbox technically never developed the original Duke Nukem Forever, it just polished and tested 3D Realms' efforts up to that point. Right now the company is focusing on projects like Battleborn instead of the Duke Nukem license. The only problem is Gearbox's last collaboration - which ended with the partner developer going bankrupt - might cause other teams to hesitate before supporting a risky project. That said, Duke Nukem 3D's gameplay has held up remarkably well over the years. It's entirely possible that a talented developer could put a fresh spin on Duke that makes his sequels bearable once more. Is there a particular developer you'd want to make a Duke Nukem sequel, or do you think his time has truly passed us by?